WGMU'S Summer Radio Camp will provide students hands-on training in a professional radio environment! 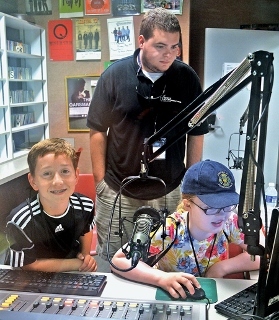 Why choose WGMU's Summer camp Students will get a chance to be a deejay and play music over WGMU, broadcast around the world form our website! Students will learn from broadcast professionals how radio works! Students will also learn how to write & produce a commercial and newscast. Field trips! There will be a trip to an area radio station which will give students a "behind the scenes" look at radio! Drop off/pick up: Lowest Level of Shenandoah Parking Deck (see left side tab for more information) MORE INFORMATION ON PARKING, SCHEDULE ETC COMING SPRING 2019! For more information - please see our side tabs for our refund/cancellation policy, drop/off pick/parking/directions etc. Please note: We are ONLY accepting Visa and Mastercard Credit Card payments. * After you register please see the IMPORTANT FORMS tab. These forms will need to be filled out and returned no later one week prior to the start of camp. If you have concerns/questions please contact Rodger Smith.